Barret Benson fights to put up a shot. The junior center finished Friday's game with a double-double. 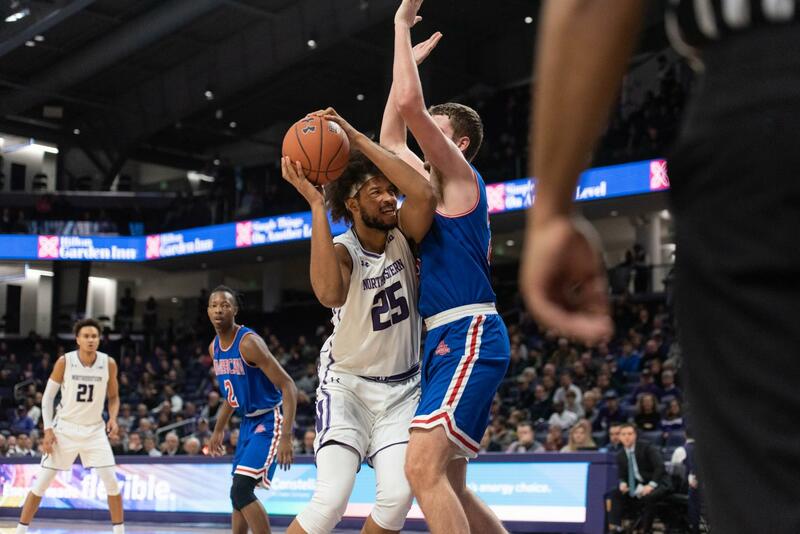 After Michael Wilbon (Medill ’80) and Tony Kornheiser trash talked each other’s teams in a live taping of “Pardon the Interruption” at Welsh-Ryan Arena, it was Wilbon’s Wildcats who stole the show when the game began. Northwestern led Binghamton seconds after the opening tip, leading by as many as 41 and easing past the Bearcats, 82-54. NU (3-0) saw nine different players find the scoresheet with five reaching double figures. Senior forward Vic Law led the Cats with 14 points and junior forward A.J. Turner had 13. Freshman forward Pete Nance and senior center Dererk Pardon finished with 10 points apiece. But the surprise star of the night was junior center Barret Benson, who came off the bench to earn a double-double with 12 points and 14 rebounds. Benson saw 27 minutes of action, compared to just 13 for Pardon, who dealt with foul trouble in the first half and was rested in the second due to the large lead. NU scored the game’s first nine points and simply did not look back, building a 48-19 lead by halftime. The Cats shot 58 percent from the floor while holding the Bearcats (1-3) to 22 percent in the opening 20 minutes. NU also had 12 assists in the first half while Binghamton dished out just one. Law started the night hot, making his first three shots from outside the paint. He had surgery in the offseason to increase his lung capacity in an attempt to improve his stamina, and has responded well so far, averaging 19.3 points in three games. It was Benson, however, who the Cats had to rely on down low with Pardon in early foul trouble. Benson scored just one point total in NU’s first two games but stepped up in a big way Friday night. His point and rebound totals were both career highs. Benson said he did not feel as locked in as he needed to be before the game, but was able to put himself in the right mindset. The Cats stretched their lead all the way to 70-29 with roughly 12 minutes left before the Bearcats found a little bit of rhythm. Binghamton went on a 19-2 run at one point but never got closer than 24 points behind. The win gave the Cats a 3-0 start for the first time since the 2015-16 season. New Orleans, American and Binghamton are not exactly top-tier teams, but the fact that NU beat each by double digits is encouraging.